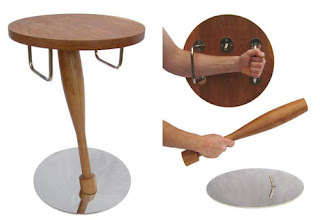 Furniture for the Paranoid: "Safe Bedside Table"
From UK designer James McAdam, the Safe Bedside Table squeezes an interesting new function into small bedroom furniture - weapons for use against home intruders! A bit of under-table storage space seems to have been sacrificed for the cause, and say what you will about how it looks, but if you're the truly paranoid type the peace of mind may be worth it. The fact that this is a defensive weapon which is not a gun is a worthwhile decision, too - all evidence shows that having a gun in the home only increases the chance of violence, especially against friends and family. Besides, if the intruders in your neighborhood tend to be barbarians, old English infantries, or other combatants who tend to use swords, clubs, and shields rather than guns, this is perfect! That's hilarious! If nothing else, a good conversation piece. Plastic material products website happen to be the very best. It absolutely was a hassle free experience and that he did not market me personally the more costly issues inside the display room. The client service have been outstanding along with would certainly store once more house2homegoods.net.